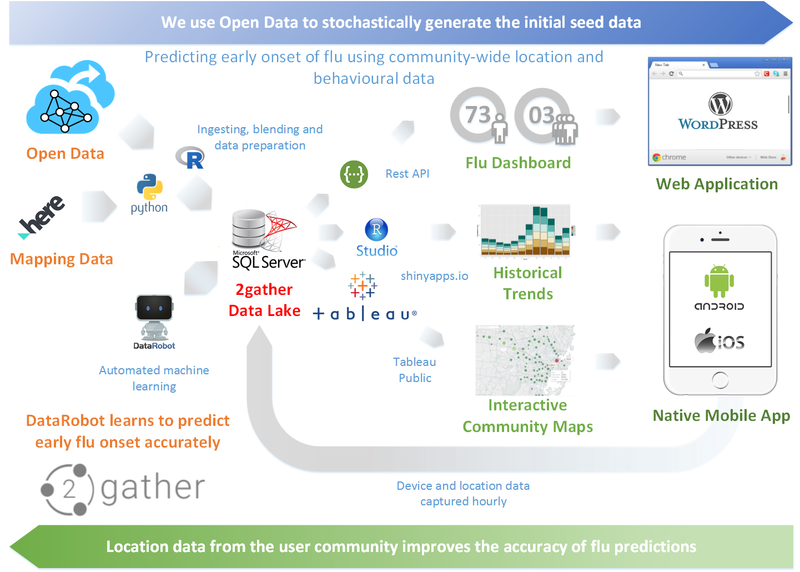 With the power of Big Data, 2gather is a world first in preventative influenza prediction. 2gather learns from the behavioural patterns of users in cities and towns around Australia, and keeps governments and users informed on how the influenza virus affects their local and work communities. With real-time updates on avoiding influenza hotspots and encouraging healthy and sustainable lifestyle habits, 2gather is Australia's response to the global issue of the influenza virus and our first step into the world of smart cities. The common flu is one of the deadliest diseases in the world, with symptoms manifesting in pneumonia and often death in developing countries. Influenza costs the Australian government more than $800 million per year in vaccination costs, hospitalisation, lost wages and labour and infrastructure stress. The tireless efforts of state and federal governments to combat its spread have been only moderately effective over a virus which has existed across all of human history. Flu symptoms evolve gradually over days. Subtle changes in beharviour, sleep patterns and movement are details which often go amiss in the bustle of day-to-day life. The result is the onset full blown symptoms and a contagious cycle that will take days and weeks to recover from. 2gather predicts the onset of influenza more accurately than the Google Flu Index or Google Flu Trends (as it is now known). 2gather centres on an app that monitors changes in behavioural patterns in individuals and communities around Australia. Relying on location awareness in mobile phones and computing devices, which are ubiquitous in modern life, 2gather is the world’s first predictive tool for analysing where influenza will strike and limiting its severity. Why do people want to use the app? Individuals, the community, industry and government all respond differently to flu prevention and outbreaks. The app observes passively in the background, requiring no effort whatsoever from the user other than to download and install the app. We envisage our case and the public health benefits becoming so compelling that mobile computing services, devices and operating systems (e.g. Android and iOS), will pre-install the app on all devices commercially produced. 2gather is a crucial step in the fight against the global problem of superbugs and is a world first in predictive diagnosis. The app tells the user how likely it is that they are infected, based on behavioural patterns learned over time and in the present. When we are unwell, we naturally prefer to rest more and work less. Via an interactive map, the app also provides the user with geographical, communal and medical insight on the spread of the flu and contributing factors which we refer to as “health stresses”. Incorporating data on these health stresses enhances the accuracy of the app. In other words, if all the app relies on is changes in behavioural patterns of a single user, it is likely to make false and incorrect reads. But with the help of Big Data on contributing factors, environmental health stresses and large scale changes in behavioural patterns of two communities (the one we work with and the one we rest and play with), the app’s predictions become increasingly accurate as the contagion evolves. We use machine learning on Big Data to predict flu onset and outbreaks from changes in behavioural patterns in the individual and across the community. The “Big Data” on our health is collected passively by the app from all users in the community, via location awareness on mobile phones and computing devices. We use government data to generate baselines and stochastically populate our seed data. When the app is first installed, it will rely on government data. Over time, government data will be systematically enriched with what the app gathers and learns from users, the sum of which represents community data. How sure are we that it will work? It is SIMPLE, relying entirely on location data. We are tapping into the undeniable human intuition that early signs of flu are there but often missed. Just to prove this, we will provide machine learning simulations based on publicly-available government data. Early detection enables us, as individuals and the community, to prevent full onset and manage contagion. Public health improves as a whole. Flu prevention measures and benefits to individuals and the community will run for pages.